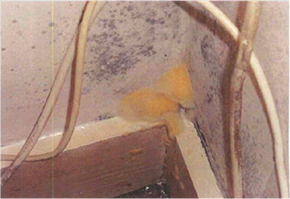 Following the discovery of fungus growing within a converted flat in Croydon, Kenwood Plc were called in to inspect. Detailed inspection identified an outbreak of true Dry Rot (Serpula lacrymans) was found to be affecting skirting boards and flooring timbers within the living room. In order to treat this outbreak and prevent another occurring we have removed the affected timbers from site. 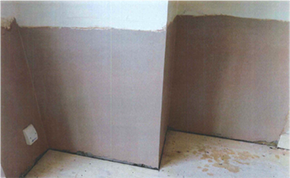 Then we injected a fungicidal dry rot killer into the each brick and replastered the wall. The flooring timbers have been replaced using pre-treated timbers which have been isolated from the masonry as a further precaution. In order to help prevent future problems we have improved the sub floor ventilation by installing two air bricks. These elements together have provided a full treatment for Dry rot which will ensure the successful eradication of the problem and along with maintaining a dry environment, prevent future outbreaks occurring.